Because that’s what the job is for. Those words are 50 years old. They did not come from poets or civil rights workers, but from children. Children who were born and raised in the suffocating stillness of segregation once attendant to the farthest reaches of the Deep South. These were the children of a gross and unfathomable iniquity. They were the grandchildren of sharecroppers and great-great grandchildren of slaves who had toiled in these Delta fields under the hot Mississippi sun longer than memory could recall. Their words survive today because they were the fruit of Mississippi’s Freedom Summer—written down on lunch bag colored paper with black and green marker at voluntarily attended Freedom Schools by wide-eyed activists who were only beginning to comprehend the ubiquitous and lethal terror that accompanied their students every moment. Right now those words are encased in glass at the Mississippi State Archives in Jackson as a testament to the bravery and humanity of those children, as well as that of their families and the volunteers who worked with them. 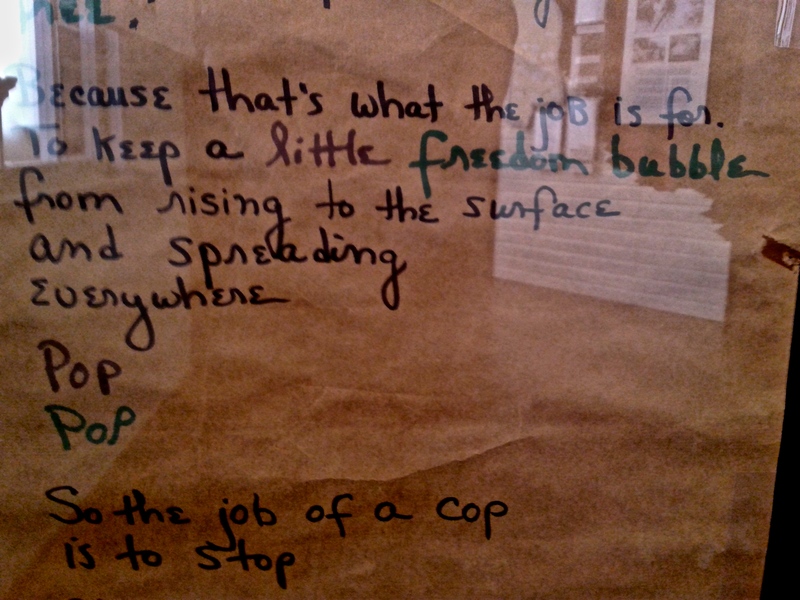 But, in another sense, the Freedom Summer exhibit is there to illustrate the differences between then and now. Like much of our nation’s civil rights history, the experiences of the summer of 1964 can be and have been used to illuminate all of the progress we have made and direct our gaze away from the stagnation that surrounds us today. Look, it seems to say as it shows us old poll tax cards and Klan uniforms. Look at how far we’ve come since then. By shining a light on the barbarities of our past, we are invited to juxtapose them with our present and marvel at how we ever could have harbored such hatred and oppression. For White America, these sorts of retrospectives—along with Disneyfied films like The Help and Remember The Titans—have the often unintended consequence of helping us to absolve ourselves of our collective past sins and to treat the Civil Rights Era and all that came before it as a separate chapter in American history. White America compartmentalizes and cordons off the actions of our parents and grandparents, operating under the false assumption that we are less prejudiced and less hateful than they were. That we are somehow above all that. But the protesters can’t go home. The black men can’t go home because there’s no telling if they’re ever going to get there without some jackbooted thug of a police officer pulling him over for a seatbelt violation and shooting him for doing what he was told or choking him to death for selling cigarettes on the sidewalk. The loved ones of those black men can’t go home either for fear that one night they get there and their father-brother-son-husband-boyfriend-best friend never makes it back because they were murdered by a cop for the crime of walking around a Walmart with a cell phone in his hand and a toy gun on his shoulder in an open carry state.. And once the deed is done and the black man is dead, no one can go home because they know that justice will never be served unless they can somehow lead the eyes of the world to constantly peer over its shoulder. The truth is not enough. It never has been and probably never will be. All of the members of the Green County grand jury saw the tape. 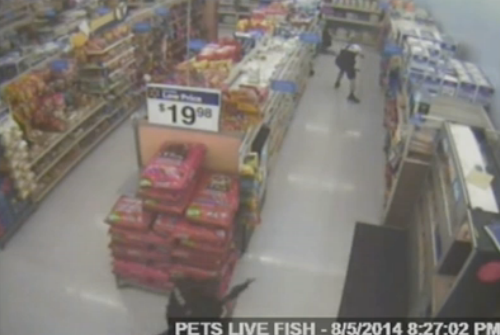 They saw John Crawford pick up an already unpackaged BB gun. They saw him meandering up and down the aisles by the garden center with the toy gun casually slung over his shoulder and talking on the phone with his girlfriend as customer after customer after customer walked by him without apprehension. They heard the absurd and erroneous set of circumstances being described by a convicted thief and fraudulently enlisted “ex-marine” to a 911 dispatcher and they saw that these claims bore no resemblance to what they saw on the tape and they watched as Beavercreek’s finest stormed into that Walmart and shot John Crawford twice without even the slightest attempt at deescalation or communication beyond violent shouting. Those grand jury members saw all of that evidence that pointed to the inescapable truth that Officer Sean Williams had killed an innocent man in cold blood and they still declined to indict him. There is a rage that has begun boil over—it is the rage of people who have been reminded with alarming frequency that their lives mean nothing in the eyes of those who hold power. As I type this, the streets of Ferguson are burbling with a white hot anger that has been compressed and condensed over the past few weeks and which has burst forth once more as word is being spread that another body could be awaiting ceremonial pickup from an ambulance that isn’t bound for a hospital, but for a morgue. 50 years ago we had a Freedom Summer down in Mississippi and now, we must prepare for a Freedom Winter. All of the idealism and hope of the Civil Rights Era has withered away under a half century teeter-totter of progresses and regresses and the torrent of unjustly slain black men’s bodies that has fallen upon us recently. What is left from those long ago days is little more than a 400 year old frustration that has been left to fester and ferment in our “post-racial” nation. A frost is coming America. Bundle up and pray it thaws fast.